Last week (27.02-01.03.) OKW Gehäusesysteme took part in the embedded world trade fair together with Hoffmann+Krippner, who are also located in Buchen. This cooperation promises perfect coordination between customer-specific operating elements and individual enclosure solutions. The embedded world trade fair in Nuremberg, Germany, is the world's leading trade fair for embedded systems. 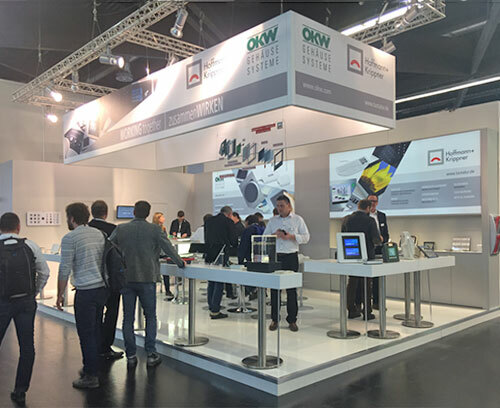 The numerous trade visitors were shown the diverse ranges of products of both companies on the joint exhibition stand of OKW Gehäusesysteme and Hoffmann+Krippner. For example, customer-specific operating elements can be optimally combined with OKW enclosures and tuning knobs to create an individual customised solution. The exhibited product portfolio went down very well with the visitors. 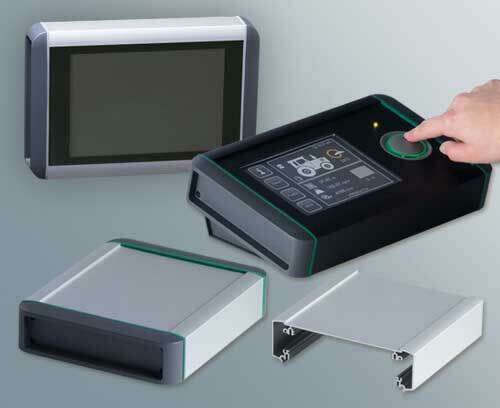 In addition to numerous plastic enclosures and tuning knobs, OKW Gehäusesysteme presented the new SMART-TERMINAL aluminium profile enclosure as a special highlight. This series of enclosures simultaneously offers robustness and elegance, 3 sizes with plenty of space for large-volume installations as well as a variety of technical advantages. The exceedingly varied EVOTEC range of table top enclosures as well as the BODY-CASE wearable enclosure with a new, optional charging station were received with great interest. Hoffmann + Krippner is a leading provider of customer-specific membrane keypads and complex input systems. The trade visitors were able to find out about the comprehensive range of products, from a simple input front panel to complete embedded systems. A wide range of exhibits such as illuminated membrane keypads, capacitive input systems, touch panels and sensor systems were presented on the stand. Once more, the joint appearance at the fair this year could be described as successful: several new national and international contacts were established, and interesting conversations were held, including talks about potential projects. Companies from a total of 38 countries were present at this year's embedded world. The event also had a greater surface area, more trade visitors and more exhibitors compared to last year: in six halls, 1,021 (+1%) companies from all over the world showed the 32,217(+7.3%) embedded experts from 78 countries where the journey was heading in the Internet of Things and the increasingly digitized world. On Thursday, 08.03.2018 there was a touch of nostalgia in the air. The pensioners of the OKW group visited the enclosure manufacturer at its headquarters in Buchen. 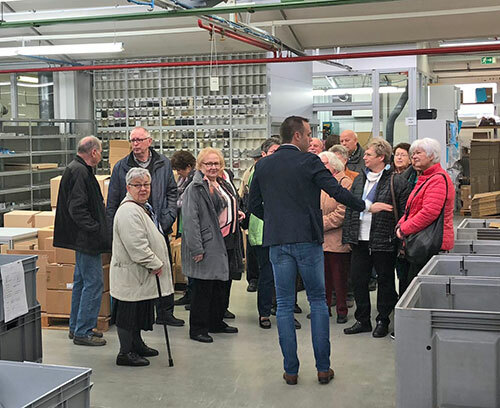 A total of 20 sprightly pensioners went on a fascinating tour through the premises of OKW Gehäusesysteme. In addition to the review of the beginnings of the company, which most of the former employees still remember very well, there were also insights into the diverse company highlights of the last few years, the product portfolio from yesterday to today and into the current logistics processes as well as the finishing of the enclosures and tuning knobs. The visitors took the time to share old memories, and on their way through the company, former OKW colleagues who are still active in the organization were also recognised. After the interesting and informative tour of the OKW company building, the afternoon came to an end with a pleasant get-together. To the beginning of the new year 2018 we changed the responsibility for the Hungarian market to our Austrian Sales partner Ineltro electronics. We are glad that we could expand the cooperation with a strong partner and are looking forward to generate successful projects together.